Dilfer attended Aptos High School in Aptos, California. Dilfer attended Fresno State, starting at quarterback for ​2 1⁄2 seasons. Dilfer helped Fresno State win or share the conference title for three straight seasons and started in two bowl games. In his junior season, Dilfer led the nation in pass efficiency en route to being named the WAC Offensive Player of the Year. He also set the NCAA record for consecutive pass attempts without an interception (271) that stood until 2007, when Kentucky quarterback Andre' Woodson broke it. He then declared himself eligible for the 1994 NFL Draft, forgoing his senior season. 1992: 188/360 for 3,000 yards with 21 touchdowns vs 14 interceptions. He also ran for 90 yards with 2 touchdowns. 1993: 254/396 for 3,799 yards with 30 touchdowns vs 5 interceptions. He also ran for 1 touchdown. He also won the Sammy Baugh Trophy for top collegiate passer. Dilfer's professional football career began when he was drafted by the Tampa Bay Buccaneers with their 1st pick in the 1994 NFL Draft (6th overall) after his junior season at Fresno State. When the Indianapolis Colts passed on Dilfer in the draft in favor of Trev Alberts, ESPN Draft expert Mel Kiper, Jr. heavily criticized their decision. This led to Colts GM Bill Tobin responding on television by asking "Who in the hell is Mel Kiper" and challenged Kiper's credentials to evaluate the draft. This exchange is often shown as one of the classic moments of ESPN draft coverage. Enlisted as the starter in his second year, after seeing spot duty in his rookie year, Dilfer struggled during what was still a dark period for the Buccaneers as a whole, when in 1995 he threw only 4 touchdown passes but 18 interceptions. The following year, he showed moderate improvement by upping his touchdown production, but failed to improve his turnover numbers (recording a career-high 19). The following season, a year that Tampa's offense was aided by the arrival of rookie Warrick Dunn and the emergence of Mike Alstott, Dilfer was the first Tampa Bay quarterback to ever go to the Pro Bowl, which some say was a reward for a highly efficient season in the Buccaneers' limited offense. In the first 12 games of that year Dilfer passed for 2213 yards, 19 touchdowns and five interceptions. However, Dilfer's performance was perceived to decline in his last four games. In the playoffs the Buccaneers defeated their NFC Central rivals, the Detroit Lions, before losing to their long-time division rivals, and defending Super Bowl champions, the Green Bay Packers. While with the Bucs, he won more games than any quarterback in franchise history and took the team to their first playoff game in 15 years. In a 1995 game against Minnesota Dilfer was ejected for throwing a punch at Vikings defensive lineman John Randle. As of 2018, he is the only quarterback in NFL history to be ejected. Dilfer threw for 21 touchdowns with the Tampa Bay Buccaneers in both the 1997 and the 1998 NFL seasons. In the 1996–1999 NFL seasons, with the Tampa Bay Buccaneers, Dilfer averaged 2,729 yards a season and had a total of 58 touchdowns. His inconsistent play continued and in Week 10 of 1999 he was injured severely, missing the rest of the season. Dilfer signed with the Ravens on March 8, 2000 and became the backup for Tony Banks. After two straight losses and four straight weeks without an offensive touchdown, the Ravens replaced Banks with Dilfer. The Ravens would lose their third straight game and fail to score a touchdown for the fifth straight week. It would be the last time the Ravens would lose a game that season, or go without a touchdown. The Ravens finished the season winning seven straight to earn a wild card berth at 12–4. The 7–1 run also gave Dilfer a 45–39 record as a starter at that point. In the playoffs, Dilfer went 3–0, and the Ravens advanced to Super Bowl XXXV in Tampa, Florida to meet the New York Giants. Halfway through the first quarter he connected with Brandon Stokley on a deep post for a 38-yard touchdown, badly beating Jason Sehorn. A third down 44-yard pass to Qadry Ismail would set up a field goal before halftime, to give Baltimore a 10���0 lead. The Ravens eventually won 34–7. Dilfer's game stats were 12 completions for 153 yards and 1 touchdown. Although one of Dilfer's passes was intercepted by linebacker Jessie Armstead and returned for a touchdown, the call was overturned due to a holding penalty against the Giants. The Los Angeles Times later described Dilfer as a game manager quarterback for the Ravens that season: He "wasn't elite, but he didn't make costly mistakes, and was supported by a dominant defense." Dilfer wasn't re-signed by the Ravens, making him the only quarterback to be let go after winning a Super Bowl. On August 3, 2001, the Seattle Seahawks signed Dilfer as a back-up quarterback to starter Matt Hasselbeck. Dilfer saw his first action when Hasselbeck injured his groin in week three against the Oakland Raiders. Dilfer started and won the next two games, before being replaced by a healthy Hasselbeck. Dilfer came on in a relief role against the Washington Redskins, when Hasselbeck struggled. He continued as the starter when Hasselbeck suffered a separated left shoulder. Dilfer started the final two games of the season, and with Seattle in the playoff hunt, won them both. He ended the season by throwing five touchdowns and two interceptions in two three-point victories. The Seahawks' AFC (they were still in the AFC in 2001) wild-card hopes ended when the Ravens beat the Minnesota Vikings 19–3 on Monday Night Football. At the end of the season, Dilfer's passer rating was 92.0 and he had won 15 straight starts. Partially because the Seattle Seahawks' starting quarterback, Hasselbeck, was coming off a season where he went 5–7 as a starter and threw eight interceptions and seven touchdowns, Dilfer was re-signed by the team to a four-year deal on March 1, and was slated as the starter heading into training camp. However, in an exhibition game against Indianapolis, Dilfer sprained his medial collateral ligament in his right knee. With the injury, Dilfer lost the starting job to Hasselbeck. Dilfer returned to the starting position against the Arizona Cardinals with a 13–24 loss. On October 28, 2002, in week 8, he suffered a season-ending torn achilles tendon against the Dallas Cowboys on the synthetic turf at Texas Stadium. At that point in the season, the Seahawks were 2–5. In 2003, Dilfer played sparingly in a relief role, and was primarily used to mentor Hasselbeck. In 2004, Dilfer started in only two games, and won them both: November 28 versus the Miami Dolphins, 24–17, and December 26 versus the Arizona Cardinals, 24–21. Hasselbeck and Dilfer remain close friends since their time together in Seattle. In March 2005, Dilfer was traded to the Cleveland Browns where it was hoped he would mentor rookie quarterback Charlie Frye. Naming Dilfer the starting quarterback for the 2005 NFL season, the idea was to work Frye into the lineup under the veteran's tutelage, but a behind-the-scenes dispute with then-offensive coordinator Maurice Carthon resulted in Dilfer's wanting out of Cleveland almost immediately. In his lone season for the Browns, Dilfer passed for 2,321 yards and 11 touchdowns, throwing 12 interceptions and fumbling 9 times (losing 7 of those). His passer rating was 76.9. He did however have the highest completion percentage of his career at 59.8 percent. The Browns would fall to 6–10. 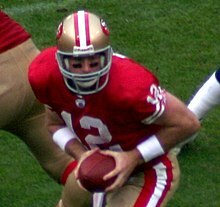 In May 2006, Dilfer was traded to the San Francisco 49ers, this time to serve as a mentor to the 2005 first round draft pick Alex Smith. In return, the 49ers gave the Browns Ken Dorsey and a 7th round pick in the 2007 NFL Draft. A close friend of former 49ers quarterback John Brodie, Dilfer received permission from Brodie and the 49ers to wear his retired number 12 in support of Brodie eventually going into the Pro Football Hall of Fame. On September 30, 2007, Dilfer took over from Alex Smith following Smith's grade three shoulder separation. He would go on to start for the 49ers in games against the Seahawks, Ravens and Giants before conceding the starting spot back to Smith. However, with Smith's effectiveness in question coming back from injury, coach Mike Nolan announced on November 14, 2007, that Dilfer would be the starting quarterback. Dilfer would go on to start in games against the Rams, in victory over the Cardinals in overtime, and against the Panthers. On December 9 in a home game against the Vikings, Dilfer suffered a head injury resulting in a concussion while diving for a 1st down on 4th and 2 that took him out of the game and subsequently the season. He was succeeded by third string backup Shaun Hill. Dilfer officially announced his retirement on July 9, 2008. Although he had suffered an Achilles' tendon injury playing basketball earlier in the off-season with his wife, Dilfer stated that he was planning to retire anyway. In 2009, Dilfer was inducted into the Fresno County Athletic Hall of Fame. Dilfer joined the NFL Network as a guest analyst in 2006. On September 15, 2007, he appeared on the NFL Network's pregame show. He was the NFL Network's color analyst for the 2008 Senior Bowl as well as a studio analyst during the 2008 NFL playoffs. On July 14, 2008 Dilfer signed on as an NFL analyst for ESPN. In 2010 it was announced that he would join Brad Nessler to call the second game of the network's Monday Night Football doubleheader on September 13 of that year. Dilfer has also coined the phrase "turned a stinky sandwich into an ice cream cone," which means that a player has turned a potentially negative play into a positive one. ESPN dismissed Dilfer in a cost-cutting move in April 2017, replacing him with Rex Ryan. Dilfer resides with his family in Saratoga, California in the San Francisco Bay Area. He is married to Cassandra Dilfer, a former Fresno State swimmer, and they have three daughters (Madeleine, Victoria, and Delaney) and a son, now deceased (Trevin); on April 27, 2003, Trevin lost his 40-day battle with heart disease at the age of five. On June 2, 2003, Trent made his first public comments regarding his family's loss and, still grieving, openly wept. Aptos High School, Dilfer's alma mater, named their football field Trevin Dilfer Field. On a broadcast of the Cardinals and Titans preseason game in 2012, Dilfer admitted he was 265 lbs and drinking himself to sleep during his tenure with the Seahawks. This was in regard to losing his son and how Matt Hasselbeck helped him to recover. Wikimedia Commons has media related to Trent Dilfer. ^ Drape, Joe; Barnes, Brooks (April 26, 2017). "A Struggling ESPN Lays Off Many On-Air Personalities". The New York Times. Retrieved April 26, 2017. ^ "SuperBowl.com wire reports". National Football League. January 29, 2001. Retrieved June 8, 2009. ^ "TSN : NFL – Canada's Sports Leader". Tsn.ca. August 31, 2010. Retrieved September 27, 2010. ^ "QB Dilfer Announces Retirement". Washington Times. July 9, 2008. Retrieved January 12, 2018. ^ "Fresno County Athletic Hall of Fame | Home". Fresno County Athletic Hall of Fame | Home. Retrieved February 2, 2017. ^ "Hawks Fun Notes: Wistrom's tribute comes up short". The Seattle Times. January 21, 2006. ^ Ludwig, Chick. "Dayton, Ohio, news and information". SpringfieldNewsSun. Retrieved September 27, 2010. ^ Hiestand, Michael (July 26, 2010). "Joe Theismann, Notre Dame telecasts, a possible fit". USA Today. .
^ "Analysts' reaction: Scarred Tony Romo now a trustworthy warrior". Dallas Morning News. September 26, 2011. .
^ "Aptos field to be named after late son of NFL pro Dilfer". Forums.49ers.com. Archived from the original on July 23, 2011. Retrieved September 27, 2010. ^ "From the Archives – Trent Dilfer". ^ "The Glory of the Ordinary". ^ Davis, Nate. "Hasselbeck: 'Blessing' to Locker, 'best dude' ever to Dilfer." USA Today, August 24, 2012. Retrieved November 25, 2014.